The city of Hue, South Vietnam, was the site of one of the fiercest battles of the Vietnam War. Three understrength U.S. Marine battalions, consisting of fewer than 2,500 men, attacked and soundly defeated more than 10,000 entrenched enemy troops, liberating Hue for South Vietnam. Situated in central Vietnam, Hue was the countrys cultural capital, a unique blend of French and Vietnamese influence. The Imperial City, it gracefully retained the glory of Vietnams past while its universities educated Vietnams brightest minds for the future. Hue was a symbol of everything the Vietnamese people admired and respected. For this reason, it was spared the terrible effects of waruntil Tet 1968. During the lunar New Year holiday of Teta very important week-long holiday celebrated all over Vietnamthe Viet Cong and the North Vietnamese Army launched a massive assault on South Vietnam. They seized the American embassy in Saigon. They also seized the city of Hue and its population of about 140,000 citizens. This Tet Offensive began on January 31, 1968. 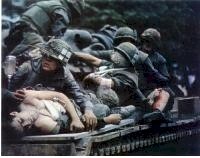 The Battle of Hue lasted four weeks and cost some 142 American lives. Marines of the First and Fifth Regiments, fighting alongside the Army of the Republic of Vietnams 1st Division, were supported by U.S. Army 7th and 12th Cavalry Regiments, among other units, in the battle for Hue. North Vietnamese and Viet Cong forces were driven out of Hue little by little as U.S. Marines retook the city one block at a time. The Marines retook the Treasury building, the university, the hospital, the Provincial Headquarters and, finally, the citadel. On February 26, 1968, the city of Hue was declared secure. U.S. forces remained another week to ensure the citys safety. U.S. Marine Seargent Alfredo Gonzalez was awarded the Medal of Honor for his fearless gallantry above and beyond the call of duty. Today, USS Gonzalez (DDG-66) honors the memory of this hero. Additionally, countless Silver Stars and Purple Hearts were awarded for other acts of heroism. Christmas, G. R. "A Company Commander Reflects on Operation Hue City,"
Marine Corps Gazette, April 1971. _______. "A Company Commander Remembers the Battle for Hue,"
Marine Corps Gazette, February 1977. _______. Secrets of the Vietnam War. Novato, CA: Presidio Press, 1990. Hammel, Eric. Fire in the Streets: The Battle for Hue, Tet 1968.
," Vietnam Combat, Winter 1985. _______. 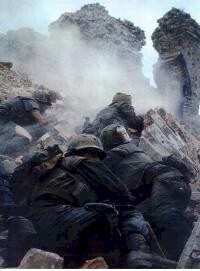 "The Last Days of Tet 68: Hard, Hungry, Horrible,"
Oberdorfer, Don. Tet! : The Turning Point in the Vietnam War. New York: Doubleday & Company, 1971.
in Perspective. Novato, CA: Presidio Press, 1978. Republic of Vietnam Armed Forces, 1969. Stanton, Shelby L. Anatomy of a Division: 1st Cav in Vietnam. Novato, CA: Presidio Press, 1987. Tolson, Major General John J., 3rd. Airmobility: 1961-1971. Washington, D.C.: Department of the Army, 1973. Tet (1969)," Hoc Tap, December 1974.